Bloomington, Ind. 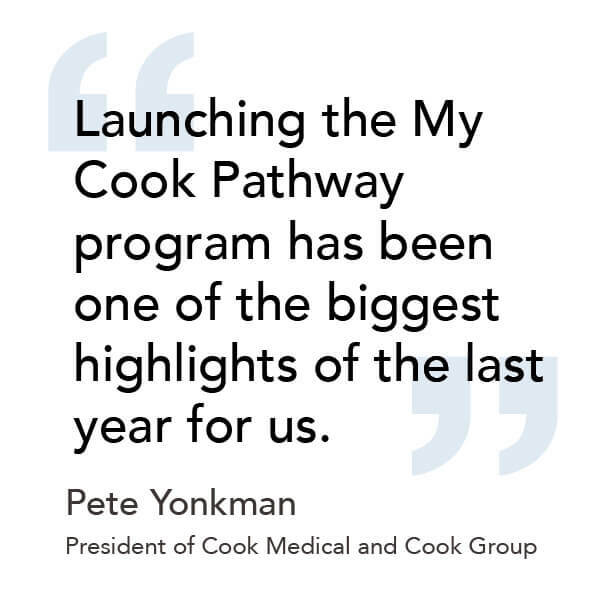 – June marked the first anniversary of the My Cook Pathway program, Cook Group’s workforce initiative. The program provides Cook employees with education and career development opportunities through financial assistance. Cook first launched the program by announcing partnerships with Monroe County Community Schools Adult Education at Broadview Learning Center and Ivy Tech Community College that provide new pathways towards career opportunities with Cook. One of the opportunities through My Cook Pathway is for individuals who do not have a high school diploma to work part-time while attending a free seven-week preparatory class to earn their high school equivalency (HSE). Upon successful completion of their HSE, these employees will become eligible for a full-time position at Cook. Through this program, 17 employees have received their HSE. In addition to continuing the HSE program, Cook expanded its higher education offerings through its Achieve Your Degree partnership with Ivy Tech Community College. The program now offers 10 areas of study, including new opportunities in engineering technology, accounting and supply chain management. The Achieve Your Degree program is also growing beyond Bloomington as Cook has worked with Ivy Tech to offer courses in French Lick and West Baden and at the Lafayette campus. 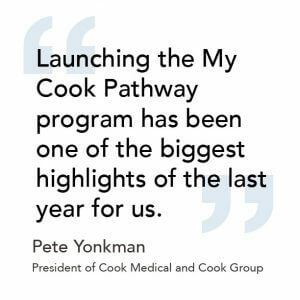 Since the launch of My Cook Pathway, Cook has seen an increase of employees participating in the tuition assistance program. “When we offered tuition reimbursement, 75 employees had participated in the program in North America. Since we began offering upfront tuition assistance to employees last year, the number has increased to more than 600 active participants, with about half of them enrolled at Ivy Tech,” said Yonkman. Cook Group companies outside of Indiana have also partnered with local higher education institutions. Employees at Cook’s Canton, Illinois, location can participate in a program similar to Achieve Your Degree at Spoon River College, and plans are underway to offer a program to employees in Winston-Salem, North Carolina.